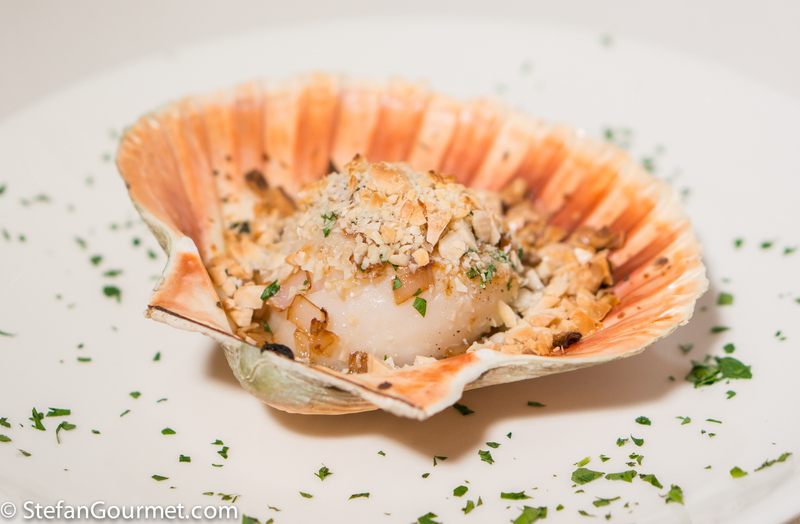 There are two reasons why it is best to use fresh scallops in the shell for this. First because such scallops have more flavor and second because they will provide you with a retro way of serving the scallops on their shell. 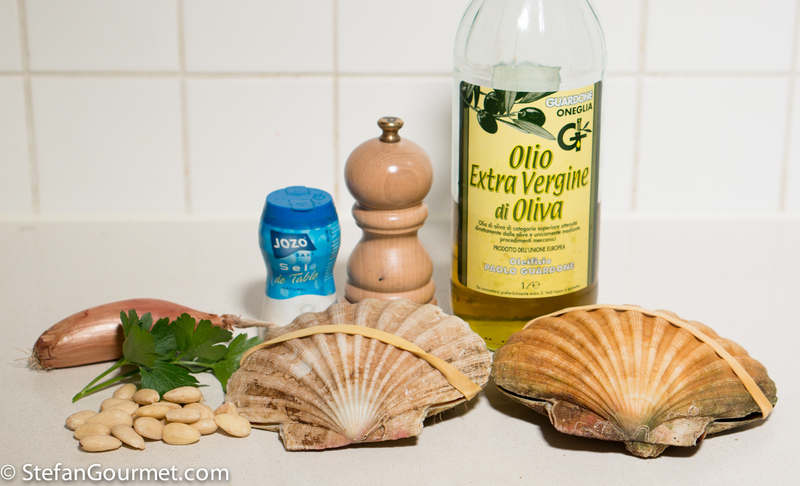 Click here to read more about shopping for scallops. 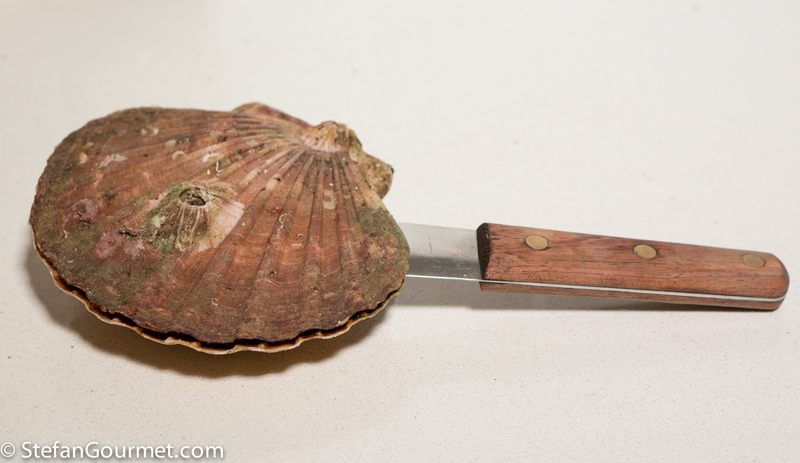 To open the scallop, insert a sharp knife into the shell and cut as close as you can along the flat side of the shell. The white part that looks like a marshmallow is what you want to eat (it is the muscle that keeps the shell closed and is used to swim). 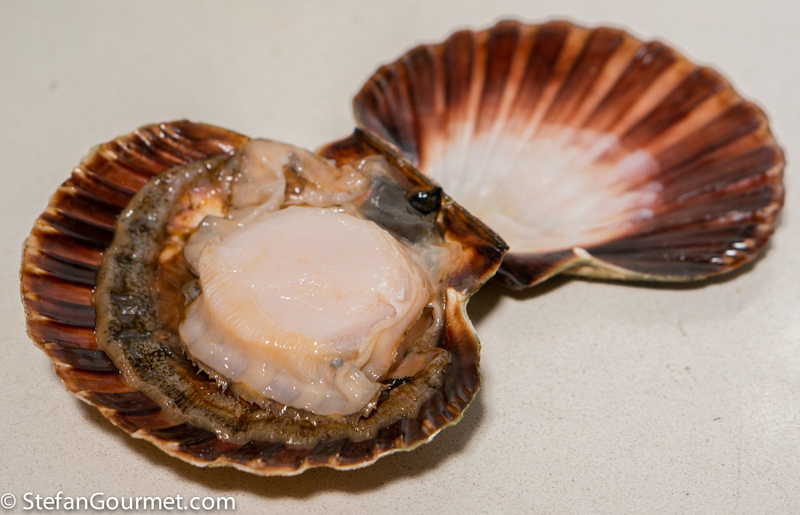 Carefully cut the muscle away from the round shell, and remove all the other stuff with your fingers. If you like you can keep the roe (the orange stuff, not visible in the photo above) attached. Rinse the scallop well with cold water and pat dry with paper towels. Keep the round half of the shell for serving. Heat 2 tablespoons of olive oil in a non-stick frying pan. Sear the scallops over high heat for 1 minute per side. 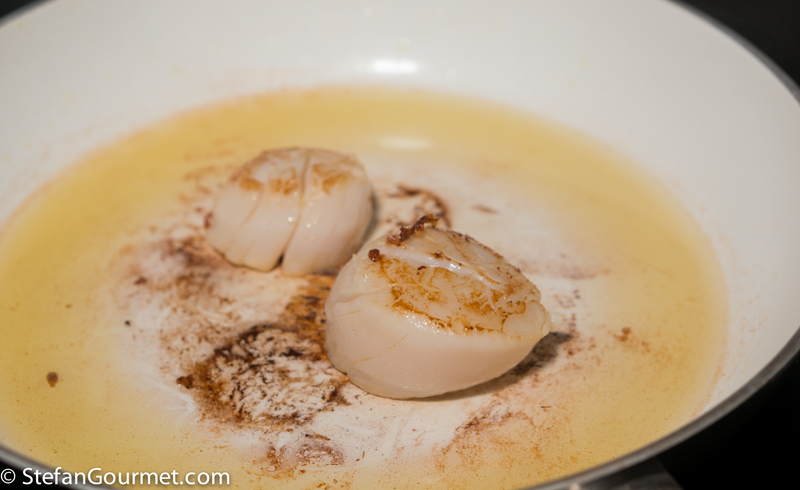 Transfer the scallops to a plate and season on all sides with salt and freshly ground black pepper. Searing the scallops before baking them adds another layer of flavor, because they won’t sear properly in the oven. 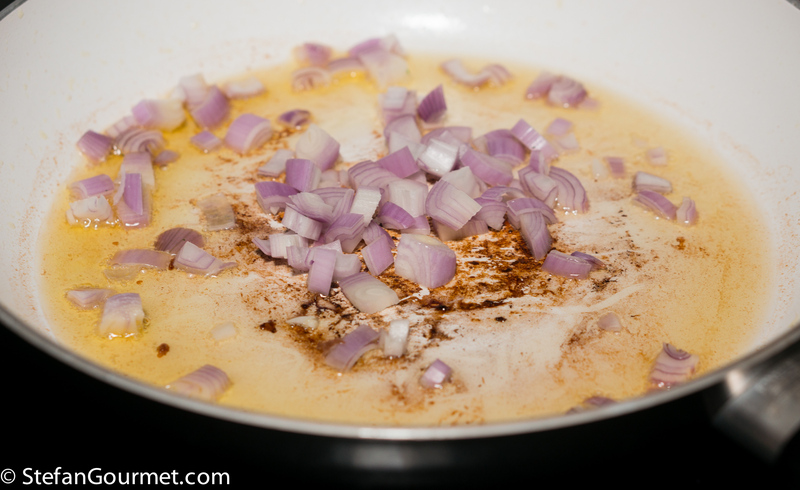 Add 1 large or 2 small minced shallots to the olive oil and scallop drippings that remain in the pan. Season with salt. 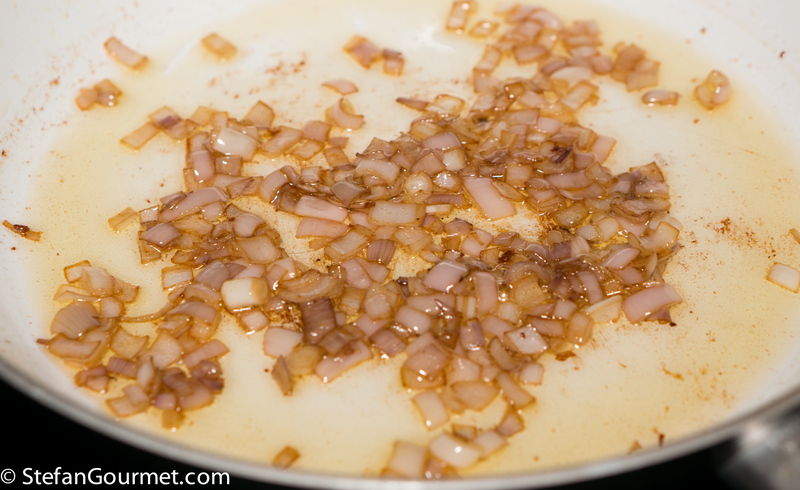 Stir over medium heat until the shallots are soft and have picked up the drippings, about 5 minutes. Watch the heat carefully as you want soft shallots, not crispy shallots. 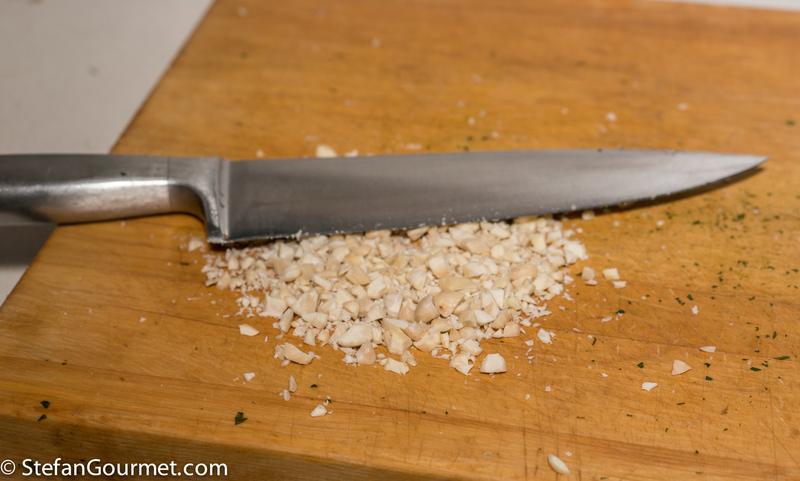 Chop 25 grams of almonds until they are medium fine. There should be fine pieces as well as larger pieces, but not big pieces. On each shell arrange first a layer of shallots sprinkled with parsley, then a scallop, and top with the remaining shallots and sprinkle again with parsley. 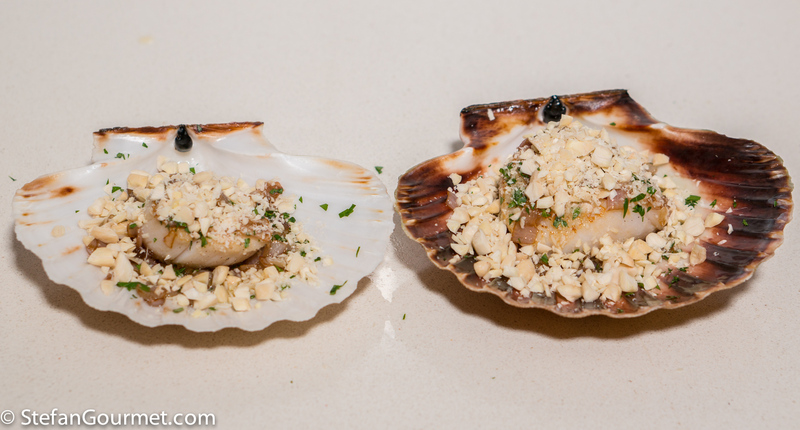 Bake about 10 minutes at 225C/450F or until the almonds are golden and the scallops are barely cooked through. Serve at once. 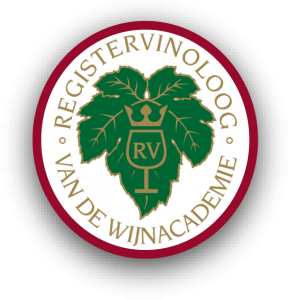 Many Italian whites have a hint of almonds and would work very well with this, like Vermentino or Verdicchio. Samphire has been an easily available ingredient around here for years, but I haven’t been using it very often. As it is such a local ingredient to me, it had not occurred to me to use it in Italian cooking. 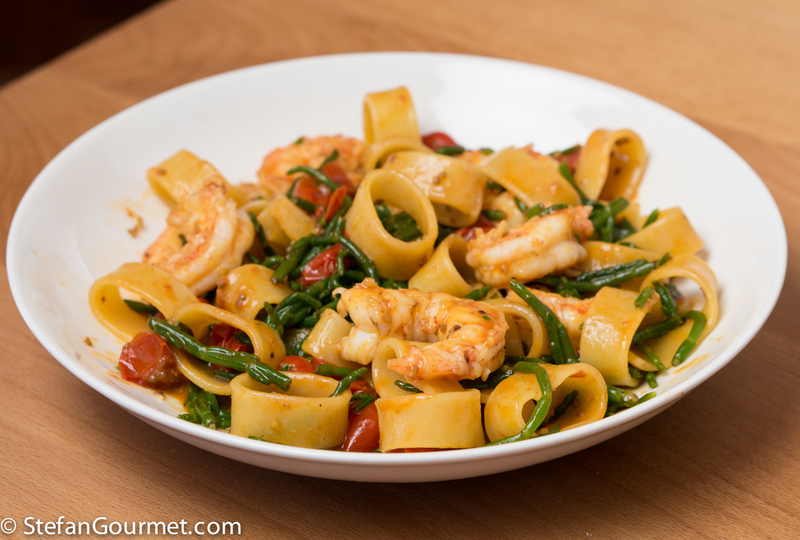 Samphire is known as ‘sea asparagus’ (asparagi di mare) or salicornia in Italy and here I made pasta with shrimp and samphire with it. Another samphire recipe will follow soon. Oh my!!! I love scallops! My traditional recipe implies only olive oil, garlic, salt, pepper, brandy, parsley and scrumble bread and I cook them in the oven, but this one with almonds and shallots looks really appealing!! !Do you think that – by using this recipe – scallops can turn out good even if they are frozen (here in Midwest very low quality of fresh sea food 😔)? Many traditional recipes cook them in the oven only, but browning really adds another layer of flavor. Oh, this is beautiful! 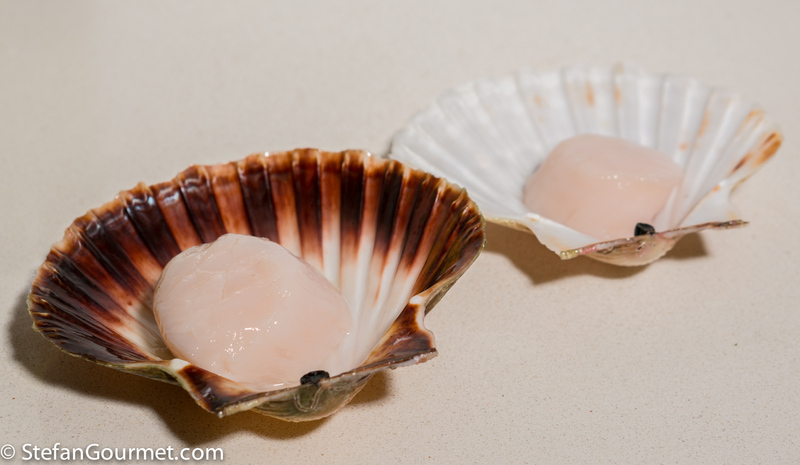 Unfortunately our sea scallops do not seem to be as large and oft, here in the country, they have already been shucked. 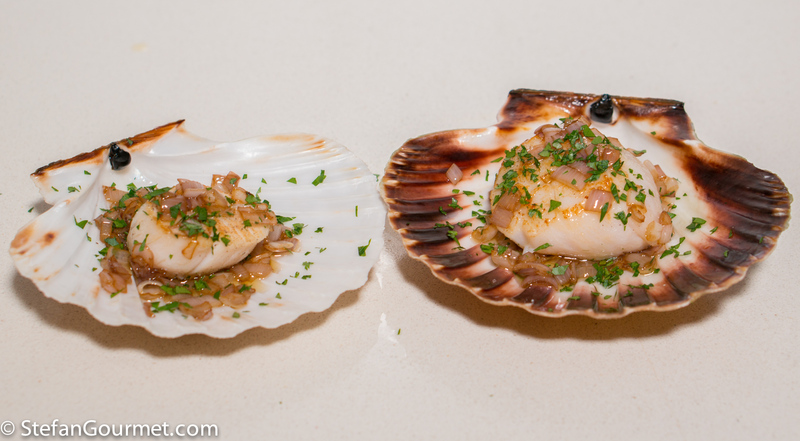 Have earthenware scallop dishes: not quite the same! I always use the roe if available. Think I’ll have to almost halve your oven time hoping that the almonds will colour . . .
You could switch to the broiler, or pre-roast the almonds for 5 minutes in the same oven. Thanks – had thought to do this . . . and, I might prefer natural scallop shells and try to get the beasties complete but my ‘artificials’ were bought with oven in mind 🙂 !! PS be careful with earthenware dishes if they are not porcelain. May not be oven proof. Marking this for an Xmas Eve feast possibility! I was thinking along those lines myself, too. 10 minutes at 225 is not too much for scallops? They can become rubber? after all you already roasted. These were pretty big scallops and they were refrigerated after searing. They were definitely not overcooked. Heat transfer is pretty slow in an oven. But if you use smaller scallops or bake them straight after searing, you could pre roast the almonds and bake the scallops for a shorter time. You could also insert the probe of a thermometer in the center and pull them at 50C/120F. Thank you Stefan, di sicuro è un piatto eccezionale!